We had been going to go straight to Ashhurst after leaving Takapau, but strong winds forced us to reconsider. 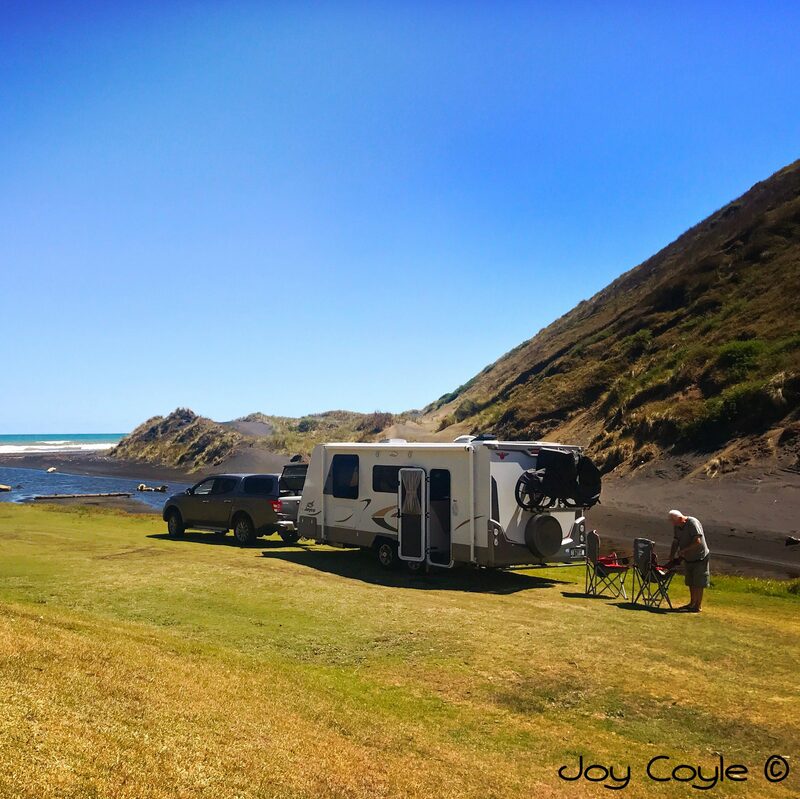 We didn’t fancy doing the Saddle Road in gusty winds towing a caravan, as coming down the plains from Takapau was so bad, we feared being blown off the road. We made a decision to stop in Dannevirke Campground (#3961) as the weather forecast for the following day was better. We were glad we’d broken the journey as the next day the wind had dropped and we made the trip to Ashhurst safely. Travelling over the Saddle Road from Woodville, you see these turbines up close and they make an impressive sight. Te Apiti Wind Farm is owned and operated by Meridian Energy. There are 55 turbines over 1.250 hectares of farmland supplying electricity to the national grid. When we arrived at Ashhurst Domain we could see the turbines from our camp site. The Ashhurst Domain (no number in the app) is a campground for CSC vehicles though there are toilets and showers (hot showers cost $2, cold showers free). At $10 per person for a powered site, or $7.50 unpowered, we thought it was good value. The office is unmanned but there are envelopes available and a slot to post the envelope with your money in. There are walks, mature trees, and a playground by the parking lot. A lovely spot, and I’m sure we will return. Knowing we would be heading to Auckland on Friday for a family event over Auckland’s Anniversary holiday weekend, it would have meant rushing the trip, so it will have to wait for another time. Some grand old buildings there!